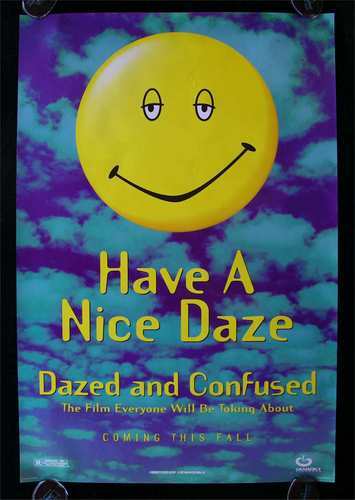 Have A Nice Daze. Teaser poster for Dazed and Confused. See it with a bud!. HD Wallpaper and background images in the Dazed and Confused club tagged: dazed and confused image poster teaser smiley have a nice daze. This Dazed and Confused photo might contain हस्ताक्षर, पोस्टर, पाठ, चॉकबोर्ड, साइन, साइन इन करें, वेन आरेख, वेन का आरेख, वेन के आरेख, मोबाइल फोनों के लिए, हास्य पुस्तक, मंगा, कार्टून, एनीमे, कॉमिक बुक, and manga.